Nora Olsen, 2010. 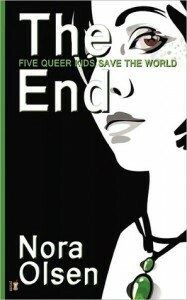 Just what the title says: when a war breaks out in 2014, five queer teens find one another and conspire to save the planet. There’s a weird framing device where the war is actually caused by an evil demon, and the gay kids all discover they have a secret power, but really this is more a straight-up (ha) dystopia. The gayness is handled nicely; you’d expect a group of queer kids to feature three or four boys with a token lesbian and maybe someone who likes drag, but instead we have lesbian Julia, lesbian femme Vikki, sort-of-FTM and sort-of-straight Marly, bi Ginger, and bi Scott. And even with all that going on, gaiety isn’t the focus of the plot; it’s all about saving the world. It’s a little complicated, but so is real life, and I liked this one more and more as I got deeper into it. Recommended. This entry was posted in 2010, biracial, bisexual, black, dystopia, european, fantasy, gay male, gaytopia, lesbian, Nora Olsen, queer adult, queer protagonist, trans. Bookmark the permalink.